Wolf number | Watts Up With That? It is looking more and more like a double sunspot peak for solar cycle 24. Sunspot count is down again: A similar drop occurred in radio flux. July 11, 2013 in Solar. January 9, 2013 in Solar. January 4, 2013 in Solar. November 11, 2012 in Science, Solar. September 13, 2012 in Solar. Source: http://sdo.gsfc.nasa.gov/assets/img/latest/latest_4096_4500.jpg A couple of people have noticed (as did I) that the sun is essentially blank. June 24, 2012 in Astronomy. 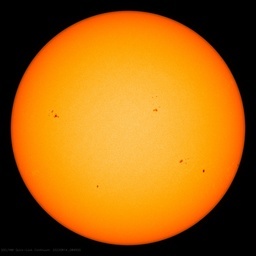 June 8, 2012 in Solar, Spaceweather. May 10, 2012 in Solar.